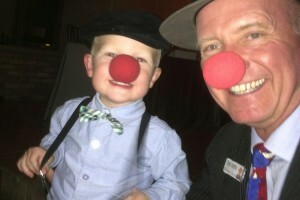 Hobbs clowning around with his nephew. He smiles at random people on the street, complements strangers for smiling, has whole presentations on smiling. As a professional speaker, he has presented to business groups not only in the U.S., but also in Singapore on the benefits of smiling. What can a smile do? Hobbs learned a major lesson as a kid. His older brother came home from school one day and bragged how he got out of trouble by smiling. According to Hobbs, his brother said, “The teacher can’t send you to the office if you’re smiling.” Right then, at age 10, Hobbs got hooked on the magic of a smile. But he took smiling in a slightly different direction from his older bother, not as a way to get out of things – but as a way to get into things. He got involved in children’s theater and clowning – beginning his lifelong commitment to causing smiles. Hobbs has another trademark – hats. And he is a man of many of them – literally and figuratively. He bills himself as The Man in the Hat. 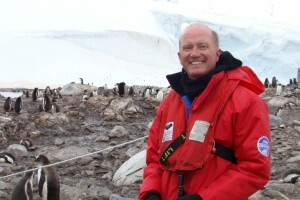 Hobbs in Antarctica with penguins. Before devoting most of his energy to being a motivational speaker, some of the jobs Hobbs has held are: aircraft mechanic, landlord, handyman, owner of a large Christmas light installation company – still, in its 19th year, dance instructor (ballroom, country, and Latin), and dance host on cruise ships, including the Queen Mary. The cruises took him to many countries, Peru, Antarctica (where he was a Penguin Crossing Guard), Italy, Brazil, plus other countries, 137 to be exact. Since 2009 when he bought his first one, Hobbs has worn out more than six. 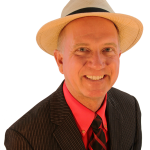 He wears a Panama hat whenever he is speaking to a business group, networking, or otherwise selling the benefits of smiling. And there are other times, too. In addition his Spellbinders work, Hobbs also volunteers for Junior Achievement and the Red Cross as an ambassador speaker. In the hassle of everyday life, Hobbs says sometimes it’s hard to remember to smile. So part of Hobbs’ advice is to have a physical reminder. It can be anything from a simple photograph on your desk to a trinket given to you by a child. 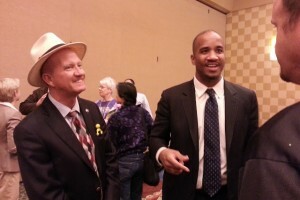 Hobbs with Mr. Yellow in his pocket at a professional event. 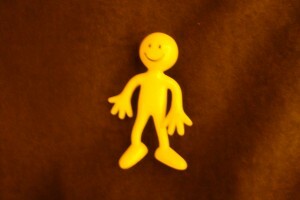 For Hobbs, it’s Mr. Yellow, a small yellow toy figure, a reminder of humor born out of a painful moment. He was sitting with the eight-year-old daughter of a friend, both of them dealing with the death of the girl’s aunt, Hobbs’ best friend and business partner. Hobbs tried to make the girl smile – using a patch of sunlight and calling it Mr. Yellow. It was a moment of special connection and, indeed, it did cause the girl to smile. So Mr. Yellow became Hobbs’ reminder, one he carries with him often. He has randomly given away over 173 little yellow men over the past two years. Understanding the value of smiling certainly changed Hobbs’ life. Now he’s out to change yours – with the backing of science. But whatever the reason, from good health to good business, to just plain friendliness and joy – count on Hobbs to be committed to making you smile. Story by Bojinka Bishop, photos courtesy of Tom Hobbs. To read about other fascinating people doing unique things, click on the “People” tab in the blue navigation bar at the top of the page. Comment(s) on Can smiling change your life? Beautiful story! Penguin Crossing Guard sounds like the perfect job for a man who’s on a mission to cause smiles. My smile got wider when I read that part. I loved Mr. Yellow, too, and especially how he was born.